But sometimes that feels limiting. For instance, I have a class StreetSweeper and a class Bicycle, and want to make a StreetSweepingBicycle. Or, talking about programming, we have a class Renderer that implements templating and a class EventEmitter that implements event handling, and want to merge these functionalities together with a class Page, to make a page that can use templates and emit events. There’s a concept that can help here, called “mixins”. As defined in Wikipedia, a mixin is a class that contains methods for use by other classes without having to be the parent class of those other classes. In other words, a mixin provides methods that implement a certain behavior, but we do not use it alone, we use it to add the behavior to other classes. Mixins can make use of inheritance inside themselves. 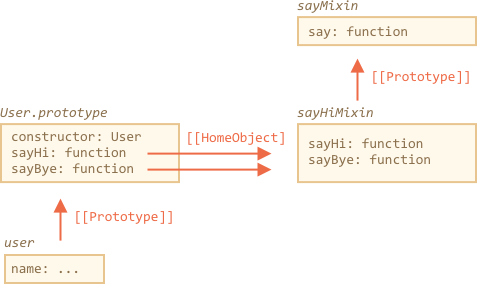 Please note that the call to the parent method super.say() from sayHiMixin looks for the method in the prototype of that mixin, not the class. That’s because methods from sayHiMixin have [[HomeObject]] set to it. So super actually means sayHiMixin.__proto__, not User.__proto__. Now let’s make a mixin for real life. The important feature of many objects is working with events. That is: an object should have a method to “generate an event” when something important happens to it, and other objects should be able to “listen” to such events. An event must have a name and, optionally, bundle some additional data. For instance, an object user can generate an event "login" when the visitor logs in. And another object calendar may want to receive such events to load the calendar for the logged-in person. Or, a menu can generate the event "select" when a menu item is selected, and other objects may want to get that information and react on that event. .on(eventName, handler) – assigns function handler to run when the event with that name happens. The handlers are stored in the _eventHandlers property. .off(eventName, handler) – removes the function from the handlers list. .trigger(eventName, ...args) – generates the event: all assigned handlers are called and args are passed as arguments to them. Now if we have the code interested to react on user selection, we can bind it with menu.on(...). And the eventMixin can add such behavior to as many classes as we’d like, without interfering with the inheritance chain. Mixin – is a generic object-oriented programming term: a class that contains methods for other classes. We can use mixins as a way to augment a class by multiple behaviors, like event-handling as we have seen above. Mixins may become a point of conflict if they occasionally overwrite native class methods. So generally one should think well about the naming for a mixin, to minimize such possibility.